Ancient Greece had a warm, dry climate, as Greece does today. Most people lived by farming, fishing and trade. Others were soldiers, scholars, scientists and artists. Greek cities had beautiful temples with stone columns and statues, and open-air theatres where people sat to watch plays. Most people lived in villages or in the countryside. Many Greeks were poor and life was hard, because farmland, water and timber for building were scarce. That's why many Greeks sailed off to find new lands to settle. What were Greek homes like? 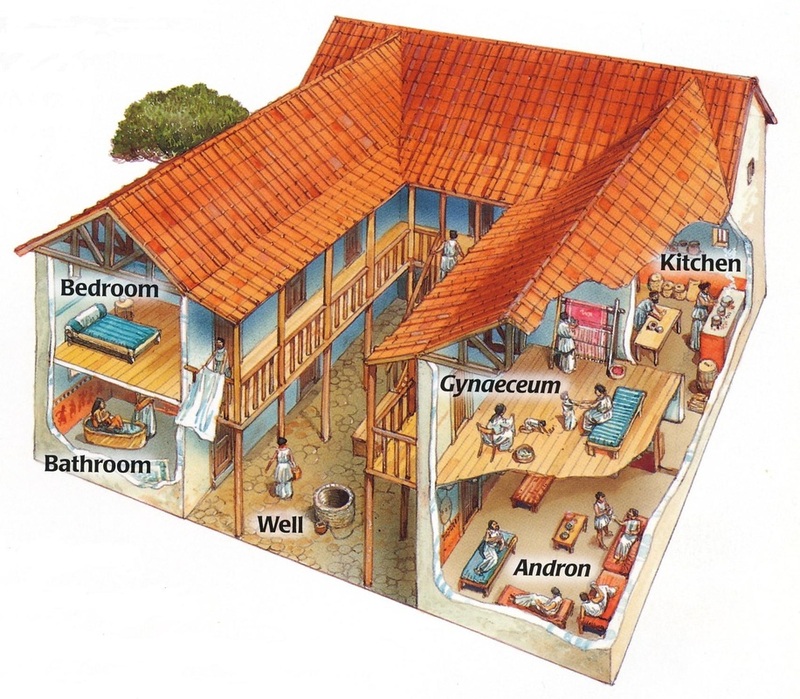 Ancient Greek homes were built around a courtyard or garden. The walls were often made from wood and mud bricks. They had small windows with no glass, but wooden shutters to keep out the hot sun. They didn't have much furniture inside. People sat on wooden chairs or stools. Rich people decorated the walls and floors with colourful tiles and paintings. Many homes didn’t have a bathroom. There were public baths, but most people washed using a small bucket or in a nearby stream. Only rich women (with slaves to carry the water) enjoyed baths at home. Afterwards they rubbed their bodies with perfumed oil to keep their skin soft. At night, Greeks slept on beds stuffed with wool, feathers or dry grass. Most people went to bed as soon as it got dark. The only light came from flickering oil lamps and candles. What was Greek fashion like? 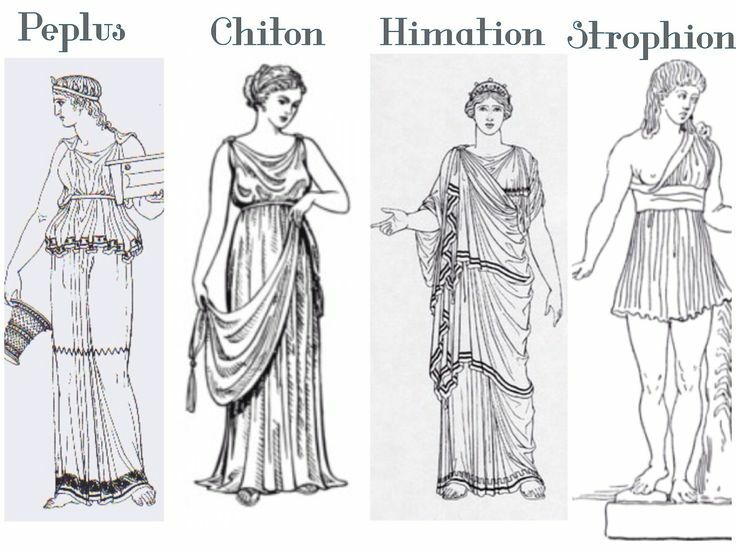 A Greek woman wore a long tunic called a chiton. This was made from a piece of cotton or linen. Over this, she wore a cloak draped from her shoulders, called a himation. This would be a thin material in summer and a thick one in winter. Young men wore short tunics, while older men preferred long ones. Slaves often wore just a strip of cloth called a loincloth. Many people walked around barefoot. Some wore leather sandals or, for horse-riding, high boots. Both men and women wore wide-brimmed hats in hot weather, to shade their faces from the sun. 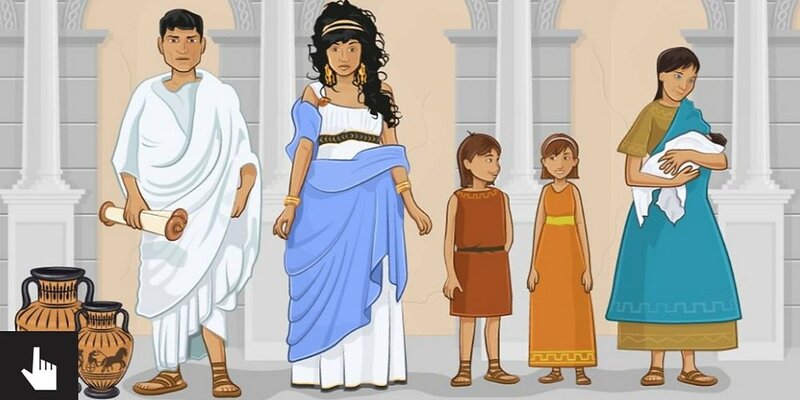 Suntans weren't cool in ancient Greece, so women put white lead on their face to make their skin pale. White lead is poisonous, so it did more harm than good. We know the Greeks liked jewellery too, because bracelets, earrings and necklaces are often buried with dead people in their tombs. Most common people wore fairly plain clothes. Only wealthy people could afford to dye their clothes different colours. We know about some Greek toys from pictures on pottery vases and artefacts found by archaeologists. Children played with small pottery figures, and dolls made of rags, wood, wax or clay - some of these dolls even had moveable arms and legs. Other toys were rattles, hoops, yo-yos and hobby horses (a pretend horse made from a stick). They also played with balls made from tied-up rags or a blown-up pig's bladder. A game of flicking nuts into a hole or circle may be the ancient Greek version of marbles or tiddlywinks! Children also kept animals. There are pictures of children with pets, like dogs, geese and chickens. These girls are playing a game of 'knucklebones'. This was a bit like jacks or fivestones, but played with the ankle-bones of goats or sheep. What did the Greeks like to eat? Men and women usually ate separately in ancient Greece. Rich people always ate at home - only slaves and poor people would eat in public. Everyone ate with their fingers, so food was cut up in the kitchen first. So what was on the menu in ancient Greece? For breakfast, Greeks might eat fruit with bread dipped in wine. Lunch might be bread and cheese. For dinner, people ate porridge made from barley, with cheese, fish, vegetables, eggs and fruit. For pudding people ate nuts, figs and cakes sweetened with honey. Only rich people ate a lot of meat. They would eat hares, deer and wild boar killed by hunters. Octopus was a favourite seafood.